I don’t know why but some divination systems just don’t work. Maybe the Tarot is legit but this particular app doesn’t give good or reliable readings. I can ask it something and have it be literally proven wrong 20 seconds later. Great if u wanna just look at the cards. But using as an oracle is a joke. Caught me by surprise how closer to situations they work ! Amazing. Ask vague question get vague answer! But if you know your question you better be prepare for answer - because it’s true. May be teach people how to be precise when they formulate the question. I did straggled at the begging. Or maybe how to cheat on question to get more information. But this is already another level. Love it! So far I am learning to read cards but I do love the app. I was looking for help learning tarot and this app is all I need. I love how I can access informative books 📚 in this app. The readings will are spot on. I’ve used and loved this app for years now but after getting the iPhone X there are numerous layout issues that make it difficult or impossible to press buttons in the app. I’m not sure if this is an easy fix or not but I can’t recommend the app to others until it has been. I love this app - so useful. But the button placement needs to be improved. When in Explore Cards, it’s hard to switch between suits without accidentally selecting a card in the current suit. After the draw there should be a complete reading of the layout. This is a very groovy program. It's easy to work, has a lot of great features & is fun to use. I would recommend this program for everyone from the novice to the pro. It’s amazing it’s as good as using the deck. I am using this app to discover the Tarot And it is so clear and easy to navigate that my journey is satisfying. This app used to be my go-to tarot app. The info is so good and the interface was a pleasure to use, however the recent update from 3 weeks ago completely ruined the app for my on my iPhone X. The bottom menu when seeing the cards descriptions is basically unusable. It’s a really well designed app. 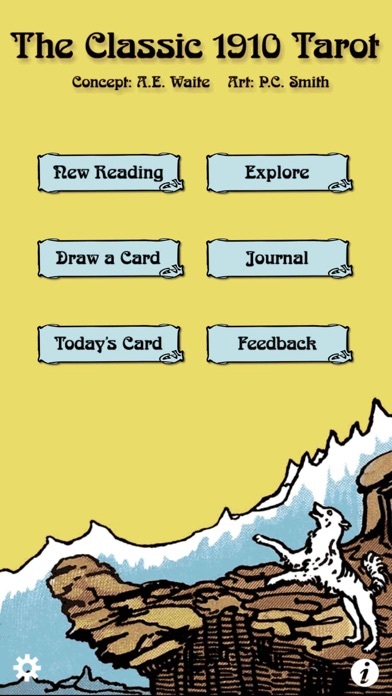 I like the many choices of readings and it’s a lot of fun to use. However, it’s been crashing on me when I try to open the journal. I’ve deleted and reinstalled the app multiple times and it’s still doing it. I can’t access the journal, it crashes every time I try to do that. This deck is my ultimate go to. I have other decks and apps but this deck is the one I come back to for clarity. One of the best apps of its kind! Yay! 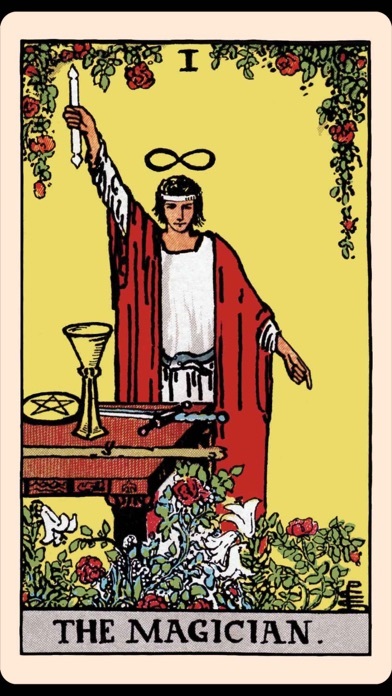 They fixed the bug that rendered the app almost unusable and as a result, the app has regained its title as the one tarot app to rule them all. It doesn’t get better than this one folks. Buy it. You’ll be glad you did. Hopefully they won’t wait nearly a year to update it again as they set the bar for all tarot apps. Thanks for adding the additional universal card meanings. It’s great! This app is the perfect way to get a quick reading when I don’t have my Tarot Cards handy. Love it! This is an updated review now that they fixed the issue with the journal crashing (much appreciated). The only thing I could still ask for is the ability to sync your journal across iPad and iPhone. Other than that it is the best tarot app by far. Crashes when trying to open Journal!!!! A very disappointing paid app. Fix it!!! Fix it!!! Fix it!!! Fix it!!! This is a beautifully designed app but the fact that ir crashes when you try to open your journal is really a bummer. I see that a lot of people complained about it in previous reviews, for a long time, and yet nothing has been done. It’s a shame, bc other than that, the app is perfect. I love this App it prepares me for the day, I really like it!! Loved for years but now it’s Crashing! I’ve come to rely on this App for years, but now it crashes every time I try to open my Journal. I deleted and reinstalled, giving up my old Journal which I wasn’t happy about but willing to do. It worked alright for about a week, but now the same thing, can’t access the Journal. Can’t recommend it anymore if this isn’t fixed. Seeing that people are reporting the same issue from weeks ago. I love this app to death, but I hate that every time I press Journal, it crashes. I’m not quite sure how to fix it on my end but until then I’m leaving it on 3 stars. I just want to be able to look back on my old readings and reflect. Still an awesome app though! I’ve just started to learn about Taro. 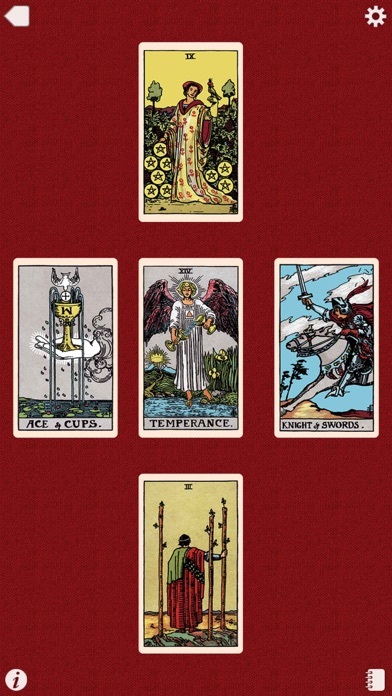 The Tarot app has helped deepen my understanding. The daily card has been accurate and helpful. When I attempt to use the journal the app crashes, hence the reason I’ve given it 4/5 stars. I have read tarot cards for many years. This app is handy and very easy to use. The readings are as accurate as the ones I got using the cards manually. Love the day’s card to meditate on too. This app really is fun and it's a great way to learn more about Tarot. I love how the cards are very similar to the original design and there are many readings to choose from. My only issue is that the journal keeps crashing every time I go to read my readings there so it be great if they would just fix this with an update and then it would be really perfect!! I’m a beginner to tarot. I have several physical decks but needed something for the go. I carry a deck at all times in my car but I can be tough to run and get it. This app was just what I was looking for. It’s just exactly what the doctor ordered. Now I’m tempted to buy their other decks. The only problem I’ve encountered is the journal button crashes the app. Besides that, this is heaven sent. Love this app but the journal no longer works. It just crashes the program. I appreciate all the information and it seems like a good app but it crashes every time I try to open the journal. I haven’t used the app in months because whenever I try to open the journal the app crashes. Might delete it. Terrific app. It has a tremendous amount of functionality. The journal stopped working as of the v11 iOS upgrade. Everything you need. Highly customizable! 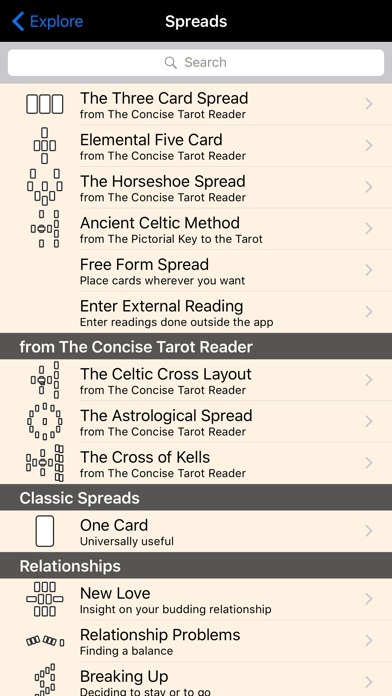 Customizable settings make it the perfect deck for those just starting to learn tarot and for experienced readers. Comes with three full books to supply the card meanings and learn more about the history. A very nicely laid out tarot site with many layouts and easy access to meanings. Thank you for creating this. Blessing for all you guys! I really love this app. Easy to use and lots of great information. It needs an update. I use this app everyday. Recently though, the “Journal” button causes the app to crash. Best tarot app by far. Can’t use the journal feature. Compatibility update would be nice, but overall great app. EXCEPT for when I try to open the journal to see past readings the app always crashes immediately. If this could be fixed, I’d love this app. I use it everyday for when I'm on the go or can't whip out my own cards. For someone who doesn't or can't own their own tarot deck, I think this is the best option. I love that it has a variety of spreads built into it and it gives you the option to randomly put the cards wherever you want-perfect for using a spread not already included in the app. If you're considering this, find tarot interesting, this is a great place to start. I love this app, I use it almost every day. It is packed, and I mean JAM packed with so much info, so many variations of styles etc. Glad somebody made this and I’d recommend it to anybody considering. I love this app - so useful. But the button placement needs to be improved. When in Explore Cards, it’s hard to switch between suits without accidentally selecting a card in the current suit. I’m waiting for an update that fixes this problem - I hope it comes soon! Wow! I’m so impressed. It is so accurate it’s scary. I use these all the time for guidance even though I know I make my own choices in life and hope for the best. I love tarot and I’m still learning this app is a great way from me to learn further....it gives detailed meanings of each card....I just love it I will definitely share this app!!! What a great app! I'm new to tarot and this app helps me so much! It's great for referencing! I even use it on my breaks at work if I need too. This is a fun application and helps me reflect on the day. I love that it works offline so I can use it on the plane etc when traveling. Great job and keep improving it! Many years back, I had a similar design set of cards. This digital version helped me to get back in touch with the magic and wisdom of Tarot. App crashes when trying to access journal. Reinstalled it 2 times and it crashes.. I've read tarot for many years, personally and professionally. It is great to have this app at my fingertips away from my deck. This app is great even has reversed meanings. This app is really helping me to learn all about tarot reading. It’s very easy to use and I love the journal entry. The only thing I wish is that we could go back and edit journal entry’s. This is amazing. I'm just learning Tarot, and this app is the real deal. Like a previous reviewer said; scary accurate. But amazingly beautiful. It is your soul, your mind, your body and the universe in one. No matter your personal opinion of occultic themes, the Tarot is an awesome tool for mental, spiritual and psychological exercises. You'll be looking under rocks in forgotten places in your mind. Worth the money. Lots of different types of readings. Seems very accurate as well. I downloaded this app to learn the tarot and I love it! It has a lot of different ways for me to expose myself to the cards, including daily draw, readings with plenty of options for spreads, and an encyclopedia of the cards and their meanings. It also includes a journal function that logs all your readings and gives you the options to take notes. Worth every penny! I have several Fool’s Dog apps and they are all wonderful. I highly recommend any and all of them. While I’m not a huge fan of the RWS art, it was time to get the classic. It’s great for studying. I do find having an understanding of tarot, basic though mine currently is, enhances the information in the app and the readings. So far, all my readings have been accurate and helpful. I love having the cards on my phone so I can do a reading any time and anywhere. The best tool and spot on! Beginners to advance- it’s a great tool to learn and explore. Best purchase. In the beginning I was hesitant to buy an app that randomly chooses cards by machine, but after I’ve tried it I’m blown away. I like the approach with asking the question before & the answers are super accurate! Thank you so much! Drawing any kind of spread, or even constructing one from specific cards is very easy. There are copious in-app resources on card and spread meanings, but they aren’t intrusive- just there in case you’re looking for them. This combined with the journal feature, which archives your spreads and can even save a page of notes on each one, makes The Fool’s Dog apps both flexible and reliable. As for the deck, Rider Waite Smith is at least the most recognizable tarot set. Much as people will say to pick a deck that “calls to you”, RWS is a mainstay for practical reasons: clear, memorable, human images that are easy to commit to memory, while still maintaining some of the ambiguity in their expressions that gives Tarot reading its value. Works all the time. Comes with lots of helpful extras. Got a first reading but now can’t navigate out of it. This, after PAYING $3.99 for the app. Useless! This problem started recently but happens on my iphone and ipad. You can no longer see the record of your divinations. The app will crash as soon as you go to journal from the main menu. Loses 3 stars for that. The problem has been ongoing for months now. Reinstalling may temporarily fix it. But u loose your record and it will happen again soon. 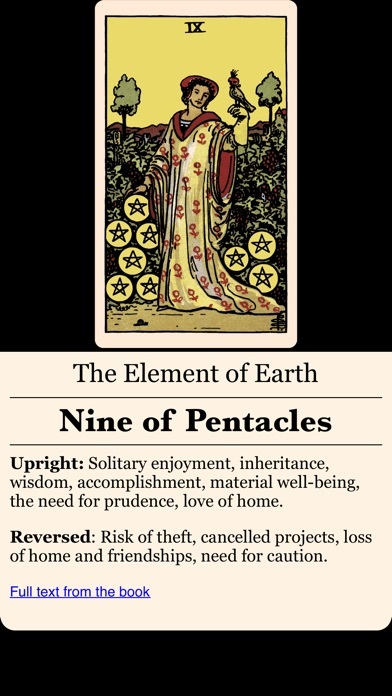 Look to Galaxy Tarot Pro on Droid for a good example of a beautiful, easy to use interface. wow... i used to love this app but now it crashes when trying to access the journal. same thing happening with prairie tarot and scrying ink lenormand. PLEASE FIX!!! It’s like having my own personal reader at my finger tips. Always accurate on my daily card. Hasn’t been working and keeps crashing on me. The creator created it this app just to abandon it in August 2016 only to charge people for dollars it's just sad because they won't update it and also because the journal part of the game makes the app close fix it this is sad you're ripping people off! Crash whenever choose Journal from menue. This is an obvious show stopper, but dev chose not to fix it. Nobody is maintaining the code since a year ago. Other tarot apps based from this code also have the same bug, like the Fellowship Fool. This app worked wonderfully, but now the journal feature is inaccessible. It attempts to load for a LONG time and then eventually crashes every time. Attempts to contact the developers have been met with silence.